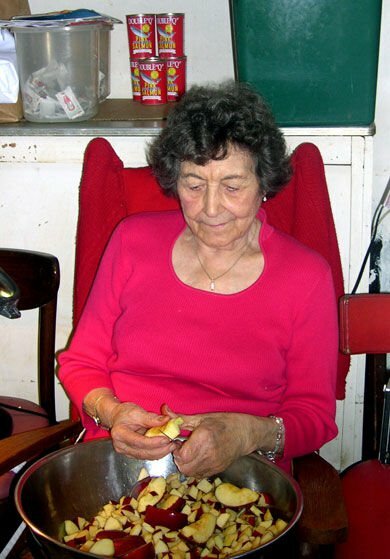 Eva Hinson peels apples in 2004 for the homemade apple pie her Eva’s Restaurant in Summerville is known for. She was 96 when she died. The owner of Eva’s on Main says she’s determined to keep the 65-year-old Summerville institution open, but needs to find someone with more time to devote to its operation. “With my current personal requirements, I can’t give it the love or attention it deserves,” Oanh Dang says. Dang recently advertised for a buyer or investors, fueling speculation that she intends to shut down the restaurant where late Summerville Mayor Berlin G. Myers had breakfast every morning. Since Eva Hinson opened at the current address, countless other local residents have similarly come to rely on the restaurant’s baked chicken, butterbeans and biscuits. According to Dang, she has no plans to close the restaurant. “It’s such a beautiful space, and it’s a Summerville staple,” she says, thanking longtime employees for attending to business details, such as work schedules and inventory, while she deals with personal matters. The following year, Dang, co-owner of Daniel Island’s Honeycomb Café, bought Eva’s. In recent years, Eva’s on Main hasn’t fared well in the court of online opinion. Lifetime fans of the restaurant have taken to Facebook to allege the restaurant’s quality standards have slipped, and Yelpers this summer criticized the community fixture for having broken seats, sticky tables and flavorless food.